Martin O'Neill is the front-runner to succeed Steve Bruce as Sunderland manager, BBC Sport understands. 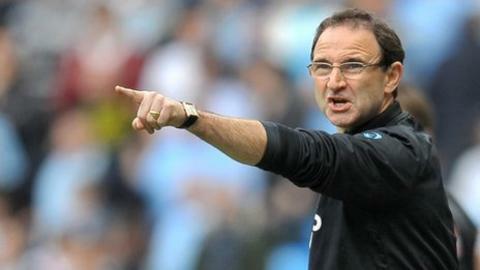 It is thought O'Neill, who left Aston Villa last August, spoke to the Black Cats on Thursday. Mark Hughes, who resigned as Fulham boss in June, is also believed to be in the frame and feels Sunderland can match his ambitions. The Black Cats are 16th, two points above the relegation zone, which led to Bruce's sacking on Wednesday. BBC Radio 5 live senior football reporter Ian Dennis said: "Martin O'Neill has emerged as the strong favourite to replace Steve Bruce. I understand discussions have taken place, although at the moment no deal has been finalised. "O'Neill is ahead of Mark Hughes, who remains a contender for the post, [and] O'Neill remains number one choice with the supporters. "The club would like to move quickly but stress the right decision rather than a quick one is most important." BBC Sport's Midlands reporter Pat Murphy knows O'Neill and he said that he would expect the 59-year-old to take the job if it was offered to him. "He's keen," revealed Murphy. "He's chomping at the bit to return to Premier League management after 15 months out. "The job of reviving a big club in front of 47,000 supporters appeals greatly - that was one of the things that appealed about the Aston Villa job and he thinks the Stadium of Light would be just as intoxicating given the fanatacism of the supporters. "I understand he's well aware that there will be no money available after the summer transfer activity of around £23m but he is happy to work with what he inherits. "As I understand it, Martin O'Neill is on a very short list." O'Neill, whose last managerial job was at Villa Park, has been regularly tipped for vacant posts at high-profile teams in the last 12 months and is the bookmakers' favourite. The former Nottingham Forest player built his managerial reputation at Wycombe Wanderers before successful spells at Leicester City and Celtic. He joined Villa in 2006 and led them to three straight sixth-placed finishes in the Premier League and the Carling Cup final before resigning before the start of the 2010-11 season. Hughes began his managerial career as Wales boss in 1999 before spells with Blackburn and Manchester City. He left Fulham after less than a year in charge. In October, he reflected on his departure from Craven Cottage, saying: "My ambition for where I wanted to take the club was not matched." Former Sunderland defender Michael Gray believes Hughes is the ideal replacement for Bruce. He told BBC Sport: "I played under Mark Hughes at Ewood Park and I loved it. I know exactly how he works and I think he would be perfect for what Sunderland need right now. "He is a personality of real stature and has a fine coaching staff, who he takes everywhere with him. He is out on the training ground every single day and knows exactly what he wants from his players." Hughes enjoyed a distinguished playing career, representing Manchester United, Barcelona, Bayern Munich, Chelsea, Southampton, Everton and Blackburn. Former Liverpool and Inter Milan boss Rafael Benitez and ex-Chelsea manager Carlo Ancelotti are also among the bookies' leading contenders to replace Bruce. And former Chelsea, Portsmouth and West Ham manager Avram Grant suggested to BBC Sport he would be interested in the job. Grant said: "I like a job with a challenge. Sunderland is a very big club. It's a very special place and the atmosphere is great. "Everything looks very professional and you don't hear ugly stories from inside the club. It's not a secret that I was a big fan of the Premier League." Sunderland have won only two of their 13 league games this season.